Two years have passed since the last update of my favorite iPad/iPhone apps for event professionals. Apps continue to be born, evolve, and, sometimes, die—so it’s time for my latest list of event professionals’ great apps! Two years have passed since I last updated my list of favorite iPad/iPhone apps for event planners. While I’m still a big fan of five of the original apps I chose just two weeks after receiving my original iPad back in 2010 (Simplenote, DropBox, Square, Evernote, and GoodReader), apps continue to be born, evolve, and, sometimes, die—so it’s time for an event planners’ great apps update! I’m still using the iPhone 5S, iPad 3, and the Tumi Alpha “everything bag” I gushed over in my 2013 app update, though I’m coveting an iPhone 6S, a newer iPad, and, maybe, an Apple Watch. Rather than listing additions and removals from my two previous posts, I’m presenting a complete alphabetized current list, including updated descriptions that incorporate any notable new features I use. An [!] next to an app indicates it’s stood the test of time, while an [N] means it’s a new addition since my 2013 update. 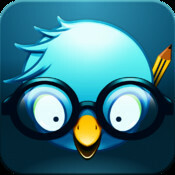 If you are active on Twitter (and I’d argue that most event planners should be) Birdbrain is a fantastic way to manage your Twitter network. The app provides an excellent overview and management of your followers and those you follow. Birdbrain handles multiple accounts, makes it easy to investigate anyone on Twitter, allows you to track unfollows as they occur, list people you’re following who don’t follow you, display mentions and retweets, and provides informative statistics showing changes in your Twitter stats over time. The only feature I’d like to see added is the ability to show inactive accounts you’re following. Recommended! I’ve been using Dropbox for years on my office Macs, iPad and iPhone. Dropbox keeps your files safe, synced, and easy to share between multiple computers and devices. All contents of the Dropbox folder on all linked devices (Macintosh, Linux, Windows, IOS, Android; even Blackberry and Kindle Fire!) running Dropbox are automatically synced when new files or changes are detected. You don’t have to be continually online; all changes sync once your computer has an Internet connection again. You can create shared folders, allowing several people to collaborate on a set of files. The free service gives you 2GB of space on Dropbox’s servers, which was plenty for me for many years (and Dropbox offers ways to increase the free limit) but last year I took the plunge and upgraded to Dropbox Pro (see below). A nice feature is that the server stores the last 30 days of versions of your files, so you can revert to an older version if needed. If you want more storage, you can upgrade to Dropbox Pro for $9.99/month or $99/year. This paid upgrade includes 1TB of storage plus unlimited older versions of your files, remote wipe, read-only shared folders, and password protected shared links. It’s worth every penny to me. The Dropbox app allows you to access your Dropbox files on your iPhone or iPad. Image, music, movie, Word, PowerPoint, Excel, PDF, Keynote, Pages, Numbers, HTML, and text file formats can be displayed by the app. Unlike the desktop versions of Dropbox, files are not stored automatically on a mobile device but are uploaded on request by marking them as Favorites. Dropbox also includes a web interface to your files, so you can access them (and older versions) from any Internet connected computer. While I was writing my books, I stored all my important files on Dropbox. It gave me great peace of mind to know that up-to-date versions of my book’s many files were being automatically saved remotely and on all my office computers. Evernote is my go-to application for capturing information I want to be able to find in the future. I use it mainly for web pages, but it will file text notes, pdfs, spreadsheets, photos, voice memos, and screenshots too. Evernote clients are available for most mobile and desktop operating systems. Everything captured is made searchable—you can add your own tags if you like—and can be stored in specific categories (“notebooks”) if desired. The iPad version takes full advantage of the large screen. Your notes are stored on Evernote’s servers and locally and are synced to your mobile device and to Mac OS X and Windows computers running an Evernote client. Evernote supplies web clipping functionality for all major desktop and mobile browsers, so, with a few clicks, it’s easy to safely capture that article you think could be really useful one day. You can upload up to 60MB per month (with a maximum single note size of 25MB) using the free Evernote service, and this has always been adequate for me. The Plus version raises the upload maximum to 1GB/month with a maximum single note size of 50MB, the Premium service to 10GB/month with a maximum single note size of 200MB. Plus and Premium include some additional benefits, none of which have tempted me to pay for them. Yet. 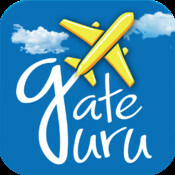 GateGuru is an airport information app that was purchased by TripAdvisor in June 2013. While it attempts to replicate some of Tripit‘s functionality, I use it to scope out the places to eat (aka amenities) at airports. The traveler’s reviews, while sometimes spotty, usually allow you to pick out the best place to satisfy your current gustatory desires, and I’ve occasionally found a real gem tucked away on Concourse C that I’d otherwise have missed. GoodReader is an inexpensive app that allows you to transfer files to your mobile device, by Wifi or from an Internet cloud server, and reliably view them. Like the Dropbox viewer, it supports a huge range of file formats. Unlike other mobile file readers, GoodReader has no problem rapidly opening, displaying, and responsively scrolling through the 350-page ebook version of Conferences That Work and other large files I’ve thrown at it. GoodReader syncs beautifully with Dropbox, allowing me to work on files on any computing device and then upload them to a GoodReader folder for convenient viewing. When I’m facilitating or presenting at an event, I’ll typically use GoodReader to display all relevant files in a multi-tabbed app window, allowing me to quickly refer to them when needed. Google Voice has been around for years and has a bazillion options, many of which I don’t really understand. But that’s OK, because I find it very useful for three things: a) transferring calls made to my cell to my office phone when I’m at home where my cell phone doesn’t work (ah, the joys of living in rural Vermont), b) replacing my cell phone provider’s voice mail and sending me an email and a noble attempt at transcription when I don’t answer my mobile, and c) texting. Now let’s be clear: I hate texting and refuse to pay the inflated rates that carriers charge for it on my cell phone, but sometimes it’s the only way to communicate with some people. Google Voice to the rescue! I can text for free from my free Google Voice number, which works with strangers as long as I let them know in the message that it’s me, Adrian Segar, texting them. 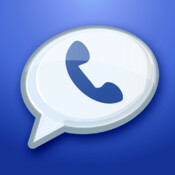 Incidentally, though I haven’t yet used this feature, calls made using Google Voice from outside the U.S. to U.S. numbers cost just 1¢/minute; a pretty good rate! This is a no-brainer, especially if you’re a cheapskate like me that won’t pay more for texting. If someone has an iDevice, I can message them without paying for texts. Unlike texting, you get to discover whether your message/photo/movie was actually delivered or not. (If Messages could tell me the recipient saw my message, that would be even better, but I guess we’ll have to wait until brain monitor functionality is built into IOS 42.) Works well for me. I’ve heard there can be glitches if you abandon your iDevice and go over to The Dark Android Side, but you’d never do that would you? Would you? OpenTable allows you to make free reservations at ~32,000 restaurants in the United States, Canada, Germany, Japan, Mexico, and the UK. No more phone calls to a restaurant only to get an answering machine, having to leave a message, and wondering whether you’ll get the reservation you wanted or not. The app works quickly and many reservations give you OpenTable points which can eventually (you’d have to use it a lot) be redeemed for a discount off your meal. I’ve written in detail about this little gem here. Suffice it to say that if you do any kind of group work with sticky notes, this is a great tool for capturing, organizing, and sharing multitudes of these colorful little rectangles. Since I wrote the linked review, 3M has continued to add new features: you can now edit notes and add additional digital notes to existing boards. Square’s Register app provides a neat inexpensive way to easily accept card payments. You can create lists of the items or services you sell. It took me just a few minutes to set up Register for selling my first book three ways—paperback, ebook, or combo—at a presentation or trade show. When you sign up for the service, Square sends you a free swipe card reader that plugs into your iPad or iPhone. They have a free contactless (NFC) and chip card reader shipping soon, in time for the new EMV chip credit card merchant obligations that will be in force in the U.S. later this year. You can also process cash sales and send receipts to a buyer’s email address. Square provides a complete downloadable record of all your sales. Square charges reasonable card fees: 2.75% for a swiped card and 3.5% + $0.15 for a keyed-in card. These are the only charges for the service; there’s no monthly fee or minimum and no contract or merchant account required. This is a great app for selling promotional items at events. I rarely need elaborately formatted documents. What I do need is a simple text editor that imports ASCII, RTF or HTML files, backs up my writing safely, and synchronizes it across my mobile and office computers. That’s exactly what Simplenote, combined with copies of Notational Velocity (free, open source) on my office computers do. Anything I write in Simplenote on my iPad (I rarely use it on my iPhone, though it works there) gets saved and backed up to the Internet cloud (on a free account at Simplenote). When I open Notational Velocity on an office computer, my notes there are synchronized. Similarly, any notes updated on my office machines are synchronized to the iPad when I open Simplenote. All communications are encrypted. Both Simplenote and Notational Velocity offer blazing fast search and support thousands of notes. For just pure writing, safely backed up and synchronized, you can’t beat the combination of these two free apps! Foursquare, started as a game (be the mayor of places, win badges, and have more points than your friends) and a way to see where your friends are and what they’re doing. I live mostly in a rural area and, while I have occasionally discovered and met up with friends I didn’t know were near me, my main use of this service is to store a searchable history of where I’ve been. When did I drop off that luggage to be repaired? What was the name of that great place I ate dinner with Susie in Atlanta? When exactly was I in Anguilla in 2009? Foursquare’s history of my check-ins is often useful in unexpected ways. In 2014, Foursquare tried to reposition their app by splitting it into two: Foursquare, a Yelp look-alike competitor, and Swarm, which would remain the “check-in” app. The move did not go well, especially after Foursquare removed the mayor feature in Swarm which took out some of the fun of checking-in. The company’s missteps cost it popularity—a lot less people seem to be checking in recently. Recently, they added back mayorships. Yes, I admit it, it’s fun to triumphantly win back the mayorship of my favorite local restaurant once in a while, but the history feature is the main reason I use Swarm these days. Waze is my favorite traffic and navigation app of the many that I’ve tried (though some Uber drivers have told me that Google Maps now has more helpful junction navigation in big cities). 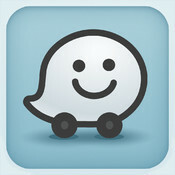 Unlike traditional GPS units with traffic updates that are often found to be woefully out of date, Waze uses information from its own users to detect traffic snarls and reroutes you on the fly when necessary to avoid that accident that happened up ahead five minutes ago or the rush hour traffic jam building up on the interstate you normally drive on to get home. Its estimates of arrival time, even on long trips, are astonishingly accurate. Owned by Google, my only concern is that the company will start using my location in nefarious ways. If I start seeing too many annoying ads promoting the tattoo parlor I’m passing by I’ll reconsider. Until then, this is an amazing app that has saved me hours of driving and frustration, and shown me countless new neighborhoods as I bypass traffic where other drivers sit fuming. Goodbye Weatherbug Elite, Yahoo Weather (still think of you fondly, loved your simplicity), and all the other weather apps I’ve dated the last few years. I’m going steady with Wunderground now. Darling W (yes, we’re on first initial terms), your gorgeous graph interface makes it easy to get a quick big picture of the next ten days, your hour by hour forecasts are so handy for deciding whether to move the social indoors, and your weather map predictions load so fast. I’d be a fool to look at anyone else. Sure, W, I admit to a fickle past with weather apps, but now I’m seriously thinking about settling down for good. With you, always by my side…So, what’s it going to be like in Maine next week? So event professionals, what have I missed? Do you have a favorite app I haven’t mentioned here? Let the world know in the comments! When facilitating, I often use sticky notes as a flexible tool that allows movement from individual work => small group work => a visual summary for an entire group. 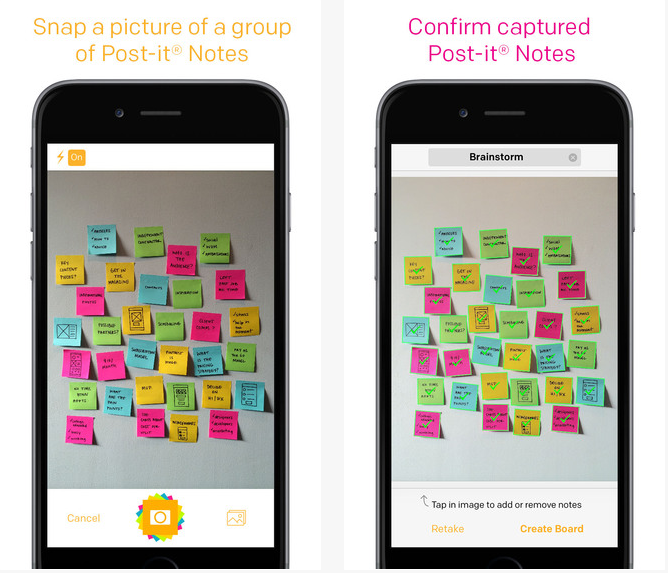 3M has just released a useful free tool for iDevices running IOS 8, Post-It Plus, that organizes and documents the results of such activities, which otherwise tend to end up as untidy rolled-up sheets of flip-chart paper or hard-to-categorize digital photographs. I ran a quick test of the app on a year-old flip-chart sheet with stick notes scattered hither and yon. Post-It Plus quickly identified all the notes (it superimposes a checkmark on each one it recognizes.) If a note is missed you can tap on it to expand it, adjust the edges, tap Done and the note will be added to the collection. Once you’ve captured all the notes, you can create a Board that holds them. But that’s just the start. Each Board can contain multiple Groups. 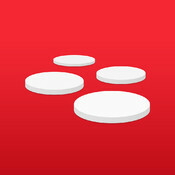 Tap and hold a note to move it to a new Group. When you’ve categorized notes as desired, you can name your Boards and Groups appropriately and share them via iMessage, email, Twitter, and Facebook, or save them to your photo library, or export them to pdf, PowerPoint, Excel, or as an image. If you link the app to your paid Evernote account, you can use Evernote’s OCR capability to make all your notes searchable. Integration with other apps, like Dropbox, are also possible, though I didn’t explore this. Post-It Plus makes further categorizing and analysis of notes post-session just about as simple as possible. The sharing and export functions make it easy to communicate uncovered themes to others. I look forward to using this app to extract more value from the rich information exposed by group sticky note process. Post-It Plus is a tool with great potential—and you can’t beat the price! Want to try out Post-It Plus? Download the free app here. Awesome. Your book has helped make @TEDxCanberra what it is.